We’d love your help. 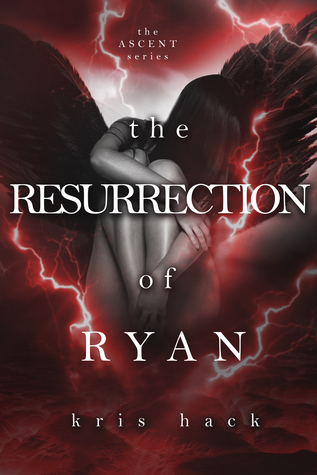 Let us know what’s wrong with this preview of The Resurrection of Ryan by Kris Hack. I thought I could continue to ignore the… talents my friends and the love of my life possess. I couldn’t. It all became too much when we moved to the compound and they were able to use them freely. I wasn’t able to handle it and now I’m on my own. The gate to Hell has been opened and demons have invaded the earth. Luckily, the portal to the underworld is small and consider I thought I could continue to ignore the… talents my friends and the love of my life possess. I couldn’t. It all became too much when we moved to the compound and they were able to use them freely. I wasn’t able to handle it and now I’m on my own. The gate to Hell has been opened and demons have invaded the earth. Luckily, the portal to the underworld is small and considering the population, few have stepped foot on earth’s soil. The demons are after what I have but I can’t let them take him. He's all I have left. To ask other readers questions about The Resurrection of Ryan, please sign up. Kris Hack knows how to weave a story like no other. I've fallen into this world of angels and feel as if I've known them all of my life. Ryan may seem weak to some but to me she's very brave. Her love for Miguel is strong but she has something else she loves more. Miguel's a very busy fallen angel, but that doesn't make his love for Ryan any less intense. This is Hacks' best book by far, I need book four now! I can't tell you how much you need this book in your life. Not my favourite of the series but still a speedy good read. Certain scenes are lacking for me. I think because of the pace of the story was so quick, depth in some places especially a certain scene that requires a boat load is missing. This doesn't detract from the story at all as it's a fast paced read but overall it reads and flows well. There is action and love, hope, hurt and a light scene that may trigger past experiences. This book in the series is mainly about a human character within the inner group. However, there is a major twist in the series/the human's life that opens the series up in interesting ways. Although Ryan (the human) made me mad at the beginning of the book, as the story went on, I lost any hard feelings I had for her. What a book, I couldn't put it down! The story line is full of doubt, confusion, mystery and evil but also friendship, determination and undying love. The characters are unique and have remarkable interactions throughout. Each book in this series kept getting better, do not miss out! I voluntarily read and review this book, all opinions expressed are my own. Ryan is a normal human and after living through the apocalypse seeing the thi So if this is your first Kris Hack read you are in for an amazing treat!! Ryan is by far my favorite character!!! This book blew me away in so many ways! I was shocked, angry, sad, and overwhelmed most of the time!! Kris Hack out did herself in this book and I am such a fan!! If you haven't read the first two books in the series you will want to go back a read them after reading this one about Ryan and then reread Ryan! By far the best of the lot in this series. I read The Ascension of Laney and The Fall of Kass quickly because they were fantastic characters and I loved the story but the reason I fell deep in love was Miguel. This book is the story of Laney's BFF, Ryan and Kass's Angel partner/BFF, Miguel. Their story is not a fairy tale by any means. Their story is chock full of Angst, drama and suspense. Kris Hack does more than tell a story, she makes you feel the story. I cried with Ryan, I got pissed with By far the best of the lot in this series. I read The Ascension of Laney and The Fall of Kass quickly because they were fantastic characters and I loved the story but the reason I fell deep in love was Miguel. Kris Hack does more than tell a story, she makes you feel the story. I cried with Ryan, I got pissed with Miguel and then I got scared for them both. The secondary characters in this book which include Laney and Kass from book one and two and Lucas (his book is next) are more than just back drops. Then are an intricate part of the story. I wont lie, there are parts of this book that will piss you off, there are parts that will make you want to throw your reading device or put it down so you can calm down, it is that emotional. There is also parts that make you swoon at the love that is shared between two people. A love that should be easy but it not so much. It is also a reread and a personal favorite. This series is why I am now interested in exploring paranormal romances. I had never read any prior and after reading the Ascent series I hope I'm not ruined, lol. I have wanted a story about Miguel & Ryan ever since I read the Ascension of Lacy. And I think Kris outdid herself with this book. This hands down is my favorite so far. Ryan is so fragile being the only human among the main characters but, Miguel would give up anything to keep Ryan safe and he more than proves it in this book. Ther This series is why I am now interested in exploring paranormal romances. I had never read any prior and after reading the Ascent series I hope I'm not ruined, lol. Ryan is so fragile being the only human among the main characters but, Miguel would give up anything to keep Ryan safe and he more than proves it in this book. There was a few things in this book that completely caught me off guard and kept me practical biting my nails to see what would happen next. All this book did was make me want so much more of this series. There's such a element of love & sacrifice in this series and Kris's writing takes you through every wave of emotion flawlessly. So if this is your first Kris Hack read you are in for an amazing treat!! Ryan is by far my favorite character!!! This book blew me away in so many ways! I was shocked, angry, sad, and overwhelmed most of the time!! Kris Hack out did herself in this book and I am such a fan!! Ryan goes through so many different things and she broke my heart multiple times. In the end I cried and my love for this series grew even more! A new favorite I found out is Lucas! Yet again, another fantastic part of a fantastic story by Kris. This book really got stuck in my head when ever I wasn't reading it. Kris's ability to weave a story that has both real day normal issues, with fantasy and love with angels and demons is amazing. Kris had done it again....I'm sucked in to her writing &can't stop reading.....I recommend to anyone over 18! Reading is a long time passion of mine and I’ve always had trouble ending the books when I close them. Characters and scenarios wou I love to read, write, and go camping, especially if it's near a beach somewhere. My furbabies and hubby love the water and so do I! We go camping whenever we can and have a blast cuddling by the fire, eating s’mores and listening to the waves crash against the shore. Reading is a long time passion of mine and I’ve always had trouble ending the books when I close them. Characters and scenarios would flow through my mind, further keeping me from much needed sleep. After a time, my own characters began running through my head, demanding to have their stories told.